Day Seventeen of the 30 Paintings in 30 Days and today is my birthday. So, I decided to create a painting that celebrates birthdays. My mom and dad started a tradition when we were kids of giving us a dime for every year of that birthday. That's why I included the coins and they start with 'C'. I used a card that I had stored away that my mom and dad gave me a couple of years back. I like how the colors on the card and the candles work together so nicely. I found an image of a canary and added the notes coming out of it's mouth. I looked up the notes for "Happy Birthday". However, I don't think the final notes are correct. But, I like the added shape they create in that corner of the painting. 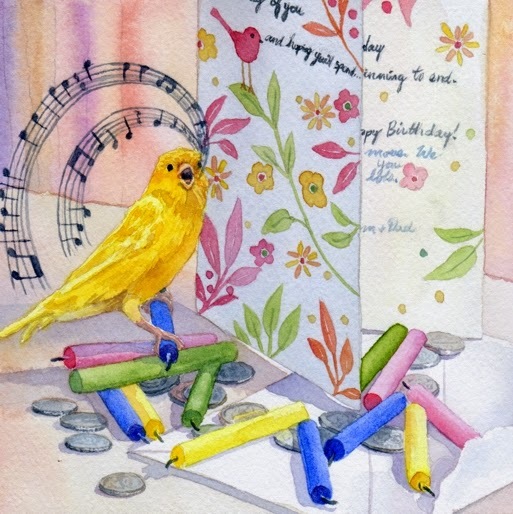 "Card, Candles, Coins, Canary" is not for sale.